Help Saige and her friend raise money for their school's art program with a cheery balloon festival! With a buildable hot air balloon, performance stage, gift stand, and more, building this playset will be a blast. The hot air balloon fits the two included mini-figures: Saige and her friend, Gabi. 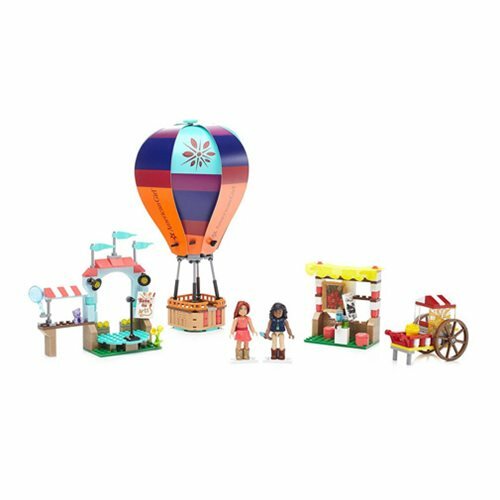 This Mega Construx American Girl Saige's Balloon Festival Playset includes various accessories such as a popcorn bucket, microphone stand, teddy bear and more! It also comes with an exclusive activity book. Be sure to combine with other American Girl playsets (sold separately) to create even more fun!